The all-new 2008 Chevrolet Malibu delivers great performance, fuel economy and refinement, wrapped in a clean, tailored design that carries the global face of Chevrolet. A broad range of detailed, well-appointed and efficient models is offered. The new Malibu is based on GM’s global midsize platform, which serves as the foundation for a strong body structure, precise build quality and refined driving dynamics. It is more than three inches (76 mm) longer than the current model, with a six-inch-longer (162 mm) wheelbase. These proportions create a wheels-at-the-corners stance that enables a smoother, more direct driving experience. Malibu is offered in several well-equipped trim levels: LS, LT and LTZ – all with standard head-curtain side air bags and front-seat thorax air bags, OnStar Gen 7 with remote diagnostics, and XM Satellite Radio. StabiliTrak stability control is standard on LT and LTZ models. Performance comes from a family of powerful dual-overhead cam four- and six-cylinder engines, including a 169-horsepower (126 kW)* 2.4L Ecotec DOHC four-cylinder engine and a 252-horsepower 3.6L DOHC V-6 with variable valve timing. A six-speed automatic transmission is standard with the V-6 and will be available later in the model year with the 2.4L four-cylinder LTZ – a segment first. The 2008 Malibu is backed by GM’s five-year/100,000-mile powertrain warranty, giving customers added peace of mind during their ownership experience. 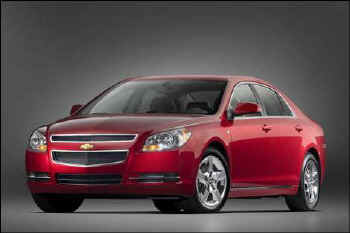 With its strong stance and bold proportions, the 2008 Malibu has a profile that reinforces its substantial feel. Clean, pure lines and wheels pushed to the corners, as well as a visually lower, yet longer, greenhouse and a shorter deck suggest motion, agility and attitude. The body sides are clean and elegant, interrupted only by distinctive, wheel-oriented forms that communicate an aggressive, stable stance and a rear profile with Corvette cues that connects to Chevrolet’s rich performance heritage. The Malibu’s grille is characteristic of the global face of Chevrolet cars and the twin round taillamps are Chevrolet cues, as well. LTZ models are distinguished by front fog lamps and clear-lens LED-lit taillamps. The design elements are complemented with precise details, including minimized panel gaps, a tight wheel-to-body relationship and select use of chrome trim. V-6 models also receive dual chrome exhaust outlets. The interior’s attention to detail matches the Malibu’s exterior, with an ergonomic design using premium materials that convey quality and value. The integrated, flowing instrument panel features a Chevrolet-signature dual-cockpit design, with prominent gauges backlit in blue, and metallic or wood grain accents. The new Malibu has greater storage, too, with thoughtful features that maximize utility, including a deep center console with a sliding cover that opens to accommodate larger items. Also standard is an auxiliary in-dash storage compartment on the instrument panel for sunglasses, CDs and other items. An available rear power center provides a household-style 110-volt AC power outlet. Malibu ’s strong structure serves as the foundation for an exceptionally quiet environment. Along with the robust chassis, which minimizes vibration and noise, the body construction uses noise-reducing materials, such as liquid spray-on sound deadener, laminated steel and composite wheel liners, to deliver one the segment’s quietest, most refined driving experiences. Laminated “quiet glass” also contributes to a quiet environment. For the first time, the Malibu is offered with two-tone trim combinations, including Ebony and Brick and Cocoa and Cashmere. There is also an all-Ebony combination, accented with a distinctive wood grain element that offers a unique, upscale appearance. Malibu 2LT models feature standard ultra suede-trimmed seats and LTZ models receive distinctive, black-chrome accents, a specific instrument layout and unique, two-tone leather seating surfaces. Heated seats are standard on 2LT and LTZ. Ambient lighting in areas such as the overhead console and door-pull pockets enhances the Malibu’s inviting feel. The overhead console-mounted LED floodlights provide subdued lighting to the center console area between the front seats. Malibu also comes with a great standard stereo system with standard XM Satellite Radio and offers a range of upgrades, including a premium eight-speaker, 210-watt sound system that is standard on LTZ and available on 2LT. Malibu ’s long, 112.3-inch (2,852 mm) wheelbase and wheels-at-the corner stance enable precise, responsive ride and handling characteristics, providing a trait that’s rare to the segment: driving satisfaction. The balanced, four-wheel independent suspension system features a MacPherson strut front suspension design and multilink rear suspension. The front suspension uses aluminum control arms, which reduce unsprung mass impacts over bumps for a smoother ride. A front, direct-acting stabilizer bar provides a more immediate feel to steering inputs. The rear suspension also features a direct-acting stabilizer bar, as well as monotube or twin-tube shock absorbers, depending on the model. The front and rear suspension systems are tuned for each powertrain combination, delivering tailored driving characteristics for all models. Hydraulic ride bushings and body control damping measures enhance the connected-to-the-road driving feel while supporting a comfortable ride. GM’s StabiliTrak stability control system is standard on LT and LTZ models. It uses sophisticated vehicle sensors tied to the anti-lock braking system to help the driver maintain control during certain maneuvers. The new panic brake assistance feature provides full braking power when a panic-braking event is detected. This can reduce the braking distance, providing more control in helping to avoid a crash. Steering response is precise and immediate, thanks to tuned steering systems designed for each model. Malibu models equipped with the 2.4L engine use a variable electric power-assist steering system, while V-6 models employ a hydraulic-assisted steering system. A family of 16-, 17- and 18-inch wheels is offered with Malibu, all tailored with a tight wheel-to-body relationship. LS models come with 16-inch painted trim wheels; 1LT models come with 17-inch chrome trim wheels, 2LT models have 17-inch aluminum wheels and LTZ models are fitted with 18-inch aluminum ultra-bright-finish wheels. The suspension systems are mounted to a robust chassis and integrated body structure that features a safety cage design and strategic placement of high-strength steel for outstanding structural integrity. The strong chassis and body structure enable more precise mounting of the suspension systems, a design trait that enabled engineers to focus on finer degrees of suspension tuning. A safety cage construction built into the Malibu’s body structure is complemented with reinforced rocker sections, as well as a reinforced front body hinge pillar and roof pillars that were designed to improve impact protection. A magnesium cross-car beam unites the lower sections of the A-pillars. This helps protect passengers in side-impact crashes and serves as a solid foundation for the instrument panel. High-strength steel is used in strategic areas to augment overall structural integrity. The 2.4L Ecotec DOHC four-cylinder engine, which receives a new catalytic converter system with slightly elevated backpressure for ’08, delivers an SAE-certified 169 horsepower (126 kW) and 160 lb.-ft. (217 Nm) of torque. EPA fuel economy is rated at an impressive 22 mpg city and 30 mpg highway. The 2.4L Ecotec DOHC will be offered with all trim levels. LS and LT models are backed by a Hydra-Matic four-speed automatic transmission. Malibu LTZ models with the 2.4L engine are equipped with a new Hydra-Matic 6T40 six-speed automatic – the only four-cylinder/six-speed automatic combination in the segment. The available 3.6L V-6 VVT is a sophisticated, all-aluminum DOHC engine that uses variable valve technology to produce 252 horsepower (188 kW)* while delivering impressive EPA fuel economy of 17 mpg city and 26 mpg in highway driving. It is mated with a Hydra-Matic 6T70 six-speed automatic transmission. The Malibu’s six-speed transmissions enable a strong balance between performance and fuel efficiency, with the six forward gears offering optimized performance at all rpm levels, as well as reduced rpm at highway cruising speeds. Lower rpm can enhance fuel economy and reduce cabin noise. The six-speed transmissions also feature TAPshift, which enables the driver to shift manually with steering wheel-mounted controls. All Malibu powertrain combinations are supported with GM’s five-year/100,000-mile powertrain warranty. Projected five-star government safety rating. All 2008 Malibu models come standard with OnStar Gen 7, which features advanced automatic crash notification, remote diagnostics, monthly status report and available Turn-By-Turn Navigation. It is the first factory-installed, fully integrated GPS navigation system from OnStar. Turn-by-Turn allows consumers to talk to a live adviser, who in turn sends complete step-by-step directions to customers' vehicles through their OnStar system. These audio directions automatically play through the vehicle’s stereo as needed, triggered by the OnStar system’s GPS capabilities. This enables drivers to be guided to their destination while keeping their hands on the wheel and their eyes on the road.